Last week Xenos members got together for our first Missions Night to celebrate what God is doing in missions at Xenos. Although members of our church have been faithfully praying for years in diverse settings for our many fields, this is the first time in a long time that we've hosted a Missions Night in this design. The theme of the night was our Global Partners in the Kingdom of Cambodia. 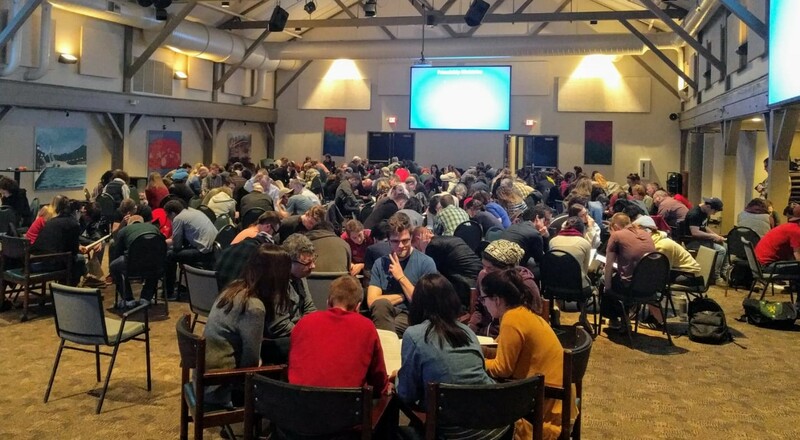 160 people got together to hear presentations on why we should pray for missions, Josh Benadum on Mercy Medical Center, Kristen Peltier on Fountain of Hope and Joe Schweitzer on Friendship Ministries. Attendees also spent time praying in small groups for our ministries in Cambodia and all our other fields. Although the meeting itself lasted only one hour, people stayed for a long time, hanging out and enjoying snacks. Attendees also could take home a booklet with prayer updates to pray individually and to bring to their home groups' prayer group. The main purpose of the meeting is to cover our partners in prayer and lift up what God is doing through missions at Xenos. An additional goal of the meeting is to establish a regular platform where everyone in Xenos can come celebrate what is happening in missions. By spreading information and promoting prayer we hope to create a motivated, unified, and informed community of mission supporters. It was a great privilege to have current and veteran missionaries, mission advocates, donors, and Xenos members all together praying and hanging out. Attendees also commented on the joy they felt when they saw a wide range of people from every demographic and age group praying with one other. We plan on hosting these once every quarter, with our next meeting scheduled for June 19th. We are very thankful for the Advocacy Teams that helped us compile the prayer requests and have continued to faithfully host monthly prayer groups for each of our fields all of these years. Thanks to Sarah Reilly as well for organizing this event and the many other volunteers who made it happen. If you are interested in receiving specific updates from all of our fields or going to one of our more close-knit prayer groups, we invite you to sign up to one or more of our google groups or email Advocacy Team Coordinators directly to get involved. If you wish to receive regular updates about Missions at Xenos, sign up for our bi-weekly newsletter. Feel free to email missionsadmin@xenos.org if you'd like our prayer booklet with prayer requests from all of our fields for this quarter.